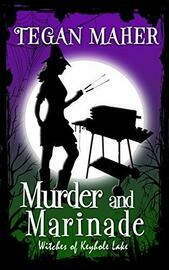 Barbecue, craft fairs, and murder? Just another weekend with the Flynn witches. When the main judge at a barbecue competition turns up murdered with a barbecue fork, it seems everybody's a suspect, including Bobbie Sue and Earl. Meat's not the only thing being grilled as they look more and more like the prime suspects. That's not all that's afoot, either. Somebody's stealing secret recipes and and seeking to sabotage the entire competition, and trouble arises at home. They came for the food and the trophy, but they may end up staying for the amenities at the iron-bar hotel.